In this series, I introduce a workflow how to use Blender, make a simple model and upload it to STYLY for the beginners without any modelling experience. This article follows the previous one. I explain the modelling of a duck potty over those two articles. In the previous article, we have finished the outline of our duck potty. This time, we make a face and colour the duck. Select the Duck Potty shaped and click the tab with pink-ish ball icon from the menu on the right and press the New button. This tab adds a material so it’s the one for colouring. Once you clicked the New button, the window shown below appeared. ① A material is added. It’s renamed “body” to avoid confusion. ② You can change the colour here. Set it to white for the duck potty. ③ You can adjust Specular Shader. The intensity controls how glossy the surface looks. You can colour the model in this way. 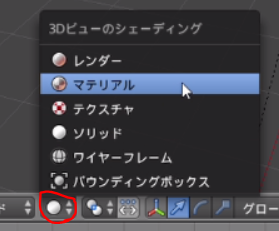 By the way, you could also switch Viewport Shading mode to Material by the icon, surrounded by the red circle below, in the menu at the bottom when you want to check the appearance of texture added or the effect of lighting later on. Basically, I recommend to use Solid mode or, in some cases, Wireframe mode for modelling work itself. You can switch between Solid and Wireframe mode by Z key. We are almost there. We need a face to finish up our duck potty. Let make it has eyes and a mouth. Let’s draw the eyes first! If you are in Edit mode, switch to Object Mode. As a new primitive will be created at where 3D cursor (red-white ring) is, you need to reset 3D cursor back to the centre by Shift+S > Cursor to Center. Keep the duck aside a bit for the moment. Next, select Circle from Create in the menu on the left. A circle has been created. 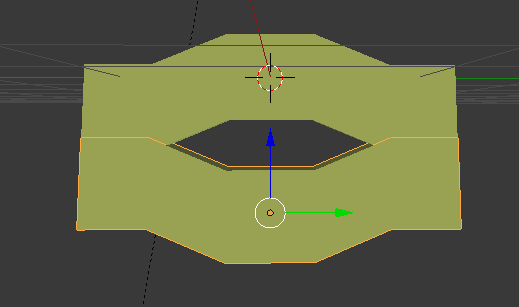 Switching to Edit mode, select Vertex in Selection Mode at the bottom. Press “F” key with all points selected (if they aren’t, you can select all by “A” key). A face has been created to fill the hole. “F” key fills the area surrounded by points if you selected more than three points. Now, you turn it by 90 degrees, paint with black, and moved to where your duck potty is. Adjust it to a relevant size. The shape of the eyes is now completed. By the way, as I just moved the eyes to a nice-looking position, you would find they are not on the body when viewed from the side. Sorry! But, it still looks pretty in a way. Next, we draw a mouth. I created a new primitive last time after switching Edit mode to Object mode. It was because, in Edit mode, a new primitive is added to the existing objects as one single group. Although I put the potty and the face together at the final stage anyway, it is not convenient to group all objects together at first place, for editing, moving and scaling them. So I prefer to make it as a separate object at the beginning. Let’s create a cube in Object mode then. After scaling down it along X-axis, switch back to Edit mode and select the face perpendicular to Y-axis. It’s time to set a modifier. You remember that you can add a modifier by the”Spanner” button in the menu on the right. Select Mirror under Add Modifier. You just need to check the box for Y-axis this time. Then, extrude the face selected earlier. Do you see any difference? 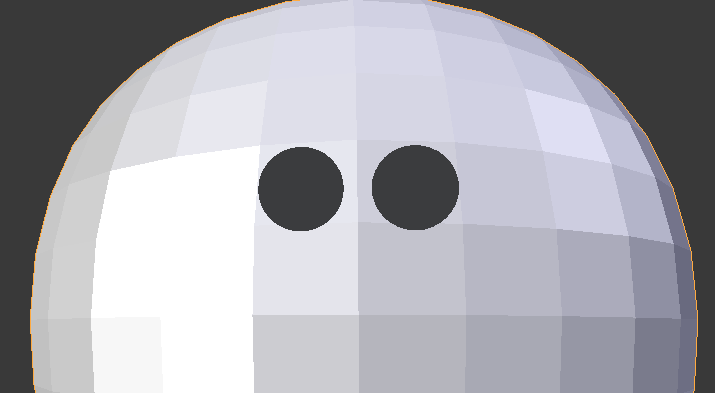 Yes, now you can see the face on the opposite side is also extruded. Mirror Modifier allows you to edit features symmetrically to the axis selected. I don’t need to do the same job twice for the opposite side and it makes feature precisely symmetrical. It’s handy, isn’t it? 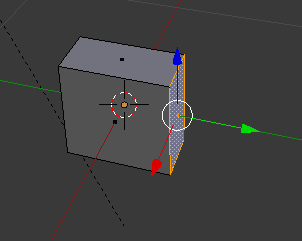 After creating the shape as shown the below, press Apply in Mirror Modifier window. Once you copy and flip it and then colour it with yellow, the mouth will be completed. Join them together to one single object by Ctrl+J. By the way, you can colour them all at once by assigning a material if you join the upper and lower mouth to one object at first. 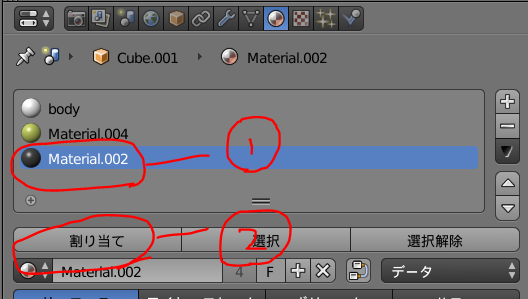 If you keep the upper and the lower as separate objects, it’s handy to use “material icon” (the one surrounded by red circle below), which allows you to select one from all materials you made so far. 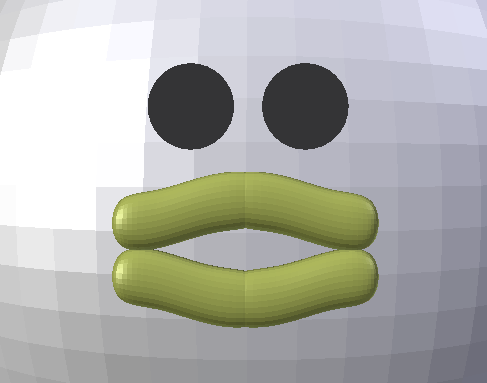 Once the mouth is completed, move it to a nice-looking position on the face of the duck. And then, keeping the eyes aside, select the mouth and the body and join them together by Ctrl+J. What’s happened? Yes, now you see the edges of the mouth are smoothed up. This is because the Subdivision Surface Modifier set to the body has also been applied to the mouth, which is now joined to the body as the same object. OK. Finally, you can press the Apply button in the Subdivision Surface Modifier window. By the way, a modifier is not applied to the joined object if you applied the modifier at first. As you don’t need to smooth the eyes, you can join them to the body after applying the modifier. Please pay attention to the timing when you apply a modifier as shown in this example. For those who applied the modifier to the body before joining the mouth to it, you could apply the Subdivision Surface Modifier to the mouth and then join it to the body. Now, your duck potty is completed! You can still add a handle or wheels as you like! If you are interested in, this is how I made them. Handle : Create a cylinder and extend it. Colour it with the same colour as the mouth. Wheels : Similar to the case for eyes, create a circle and fill it by “F” key. Extrude it and colour it with black. Make two and attach them at both ends of an extended cylinder with coloured with grey. All done. In addition, you can paint each face with a different colour. ① Select the colour you want to apply (In this example, there are three materials for the body, the mouth and the eyes. You can add more by “+” button). 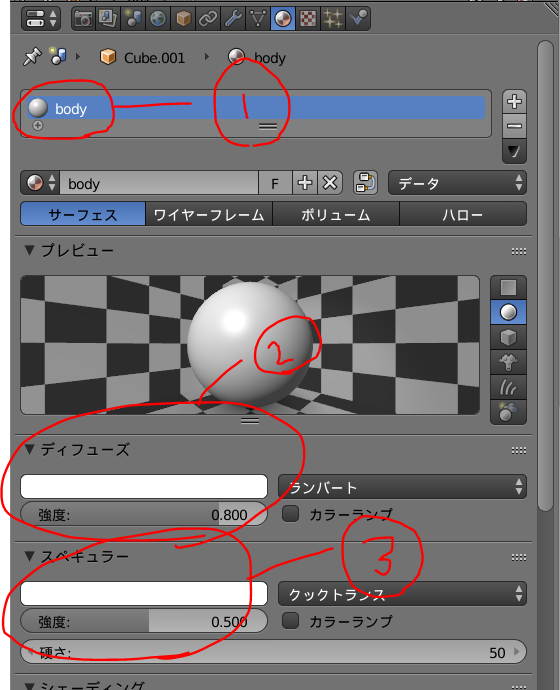 ② You can colour the selected face by pressing “Assign”. It would be cool if you add a stylish stripe on the potty. I wonder if you would add a logo. I plan to post an article about Texture next time. Please wait for it. You will find you can make a lot of stuff just by the operations you learned in this duck-potty modelling. Please try to make various models! Have you made your own duck potty? Now, let’s export the model to STYLY! Make sure that all optional features like wheels are joined to the body as the same object. 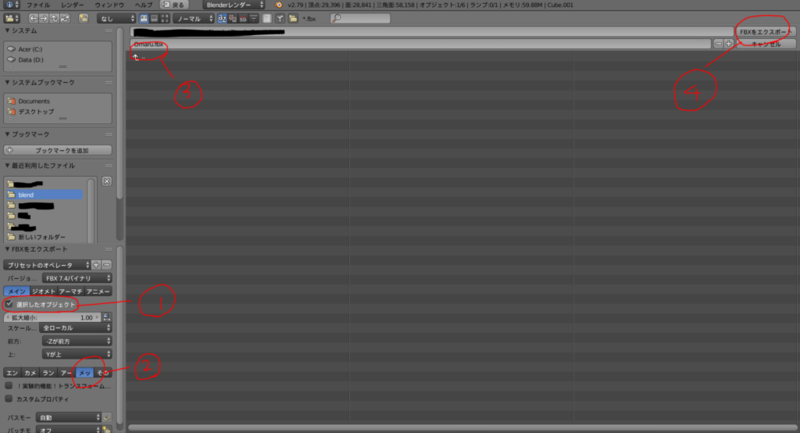 Select File in the menu on the top > Export > FBX(.fbx). The export completed! Open STYLY. 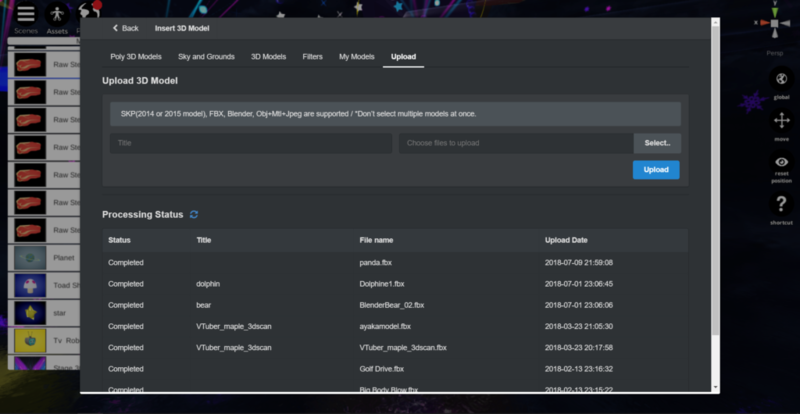 Once STYLY Editor is up, upload the model exported earlier by selecting Assets > 3D Model > Upload. When the upload is done, the status in Processing Status is changed to “Completed”. 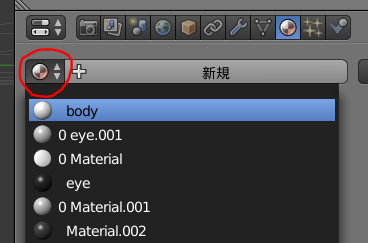 The uploaded 3D-character data is in “My Models”. Click it to place in the space. The upload to STYLY completed. 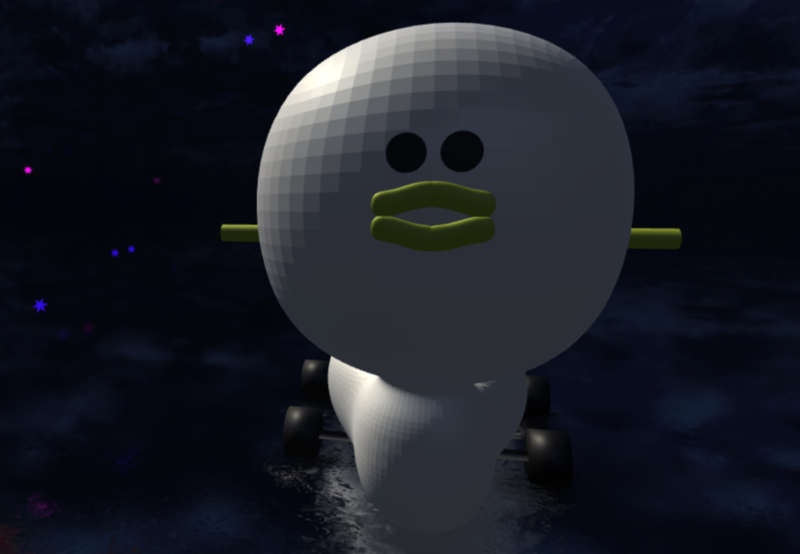 The duck potty in this article made an appearance in my Vtuber video. ・Material: A parameter defines the appearance of meshes such as colour. 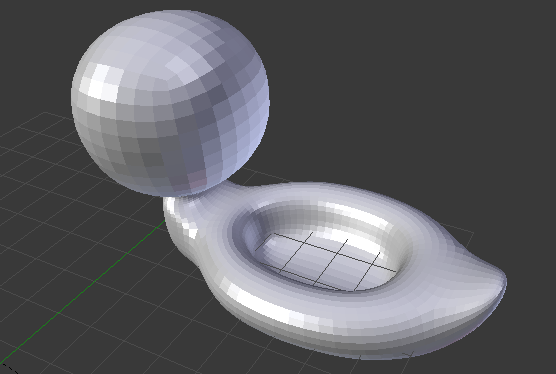 ・Viewport Shading: It allows you to switch View mode to Solid or Material etc. ・Mirror Modifier: it allows you to edit features symmetrically to the selected axis.